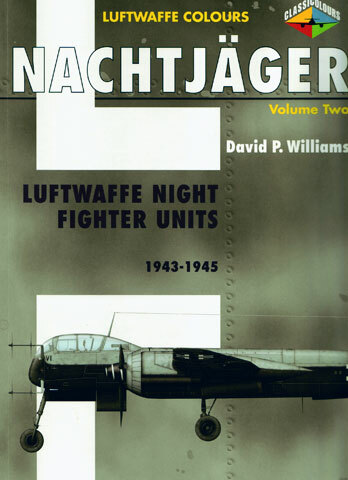 Advantages: Continues the fascinating story of the Luftwaffe night fighter units including radar systems and tactics, intruder operations, Wilde Sau and jet night fighters; concise and interesting narrative; large, relevant photos; great profiles - terrific inspiration for modellers. Classic Publications has now released "Nachtjäger Part Two, covering the period from 1942 to 1945. Dealing with this very eventful era in a single volume is an ambitious assignment, but author David P. Williams is more than equal to the task. This latest book commences with a discussion of the formation of single-engined night fighters, the Wilde Sau, and a brief summary of their operations. The text goes on to describe the Kammhuber Line, Allied countermeasures, new German tactics, major raids and night fighter responses, the final months of the war and jet night fighter operations. Typical of this series, the main body text is interspersed with personal recollections and combat reports from pilots and crews from both sides of this dark battlefield. The book comprises 96 pages in the familiar large format (303mm x 206mm) of the series. Around 200 photos, mostly of the aircraft of the period, are one of the highlights of this title. Captions are detailed and relevant, and provide useful information about the colours and markings of the subjects. The side profile illustrations are very attractive, and cover a wide selection of mid to late war night fighters. These include Bf 109s and Fw 190s from Wilde Sau units, through the backbone of the Nachtjagd, the Messerchmitt Bf 110 and Junkers Ju 88, and rarer types such as the Focke-Wulf Ta 154 and the Me 262B night fighter. I find the Nachtjag to be one of the most fascinating aspects of the Luftwaffe. It is very pleasing to see Classic Publications apply its attractive and effective style to this important corner of aviation history.